Linsly School, an independent, co-educational, college preparatory boarding school located in Wheeling, is the oldest private academy west of the Allegheny Mountains. Incorporated in 1814, the school is named for Noah Linsly, a prominent Wheeling lawyer whose will provided funds for a so-called Lancastrian academy, based on a system using trained older students to tutor younger ones. Originally located on Chapline Street and open to boys and girls, Linsly soon became an all-boys institution. In 1859, Linsly Institute, as it was then called, erected a new three-story structure, still standing at 1413 Eoff Street. With West Virginia statehood in 1863, government officials leased the building and it served as the first state capitol until 1870. (When the state capitol moved from Charleston back to Wheeling in May of 1875, Linsly Institute once again served as the state capitol building until the new facility on Chapline and 16th Street was completed in 1876). Following the Civil War, the school faced serious financial difficulties, but under the leadership of John Birch, principal from 1874 through most of the late 19th century, the school survived and flourished. 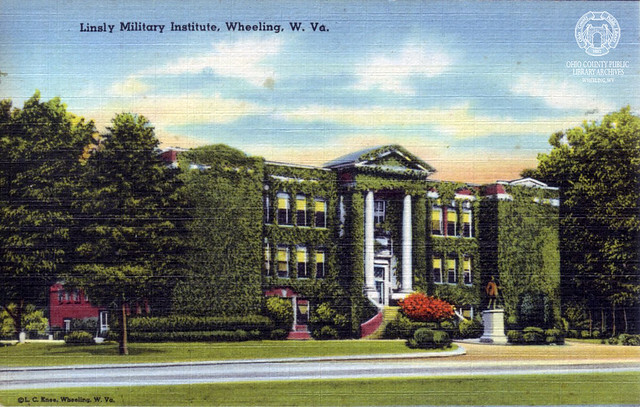 In 1877, a cadet battalion was formed, and in 1942 the school became known as Linsly Military Institute. A new building at Thedah Place was erected in 1925, as well as an imposing statue, ‘‘The Aviator.’’ In 1968, the school relocated to the new Banes Hall on Knox Lane. The military program was discontinued in 1979, and in 1988, girls were again admitted. Linsly educates approximately 425 students in grades five through 12, with one-fourth boarding students and three-fourths day students. The school expanded under the long-serving headmasters, Guy Holden and Basil Lockhart, who collectively served from 1916 to 1972. - Citation: Brennan, Margaret "Linsly School." e-WV: The West Virginia Encyclopedia. 07 October 2010. Web. 27 October 2015. "An Act incorporating Trustees of the Wheeling Lancastrian Academy in the County of Ohio" was passed by the Virginia Legislature November 29, 1814. However, according to "The History of Education in West Virginia," prepared under the direction of the State Superintendent of Schools 1907, "The Linsly Academy was opened in 1808 four years before the date of its incorporation." ▶ Vertical File: Linsly Institute, Wheeling Room, non-circulating, ask for access at the reference desk. ▶ Yearbooks: Linsly, Wheeling Room, non-circulating, ask for access at the reference desk. ▶ Yearbooks: At Ease, Wheeling Room, non-circulating, ask for access at the reference desk. ▶ Yearbooks: Linsly Military Institute, Wheeling Room, non-circulating, ask for access at the reference desk. ▶ Archives & Special Collections: Linsly Football, Archival Collection - primarily DVDs of games from 1947-1976. Must make an appointment to access materials. Call 304-232-0244.